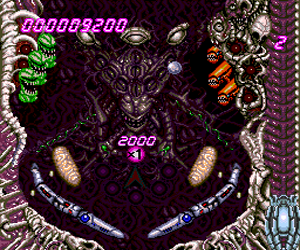 The moment I booted this game for the first time and had a look at the visuals, I said to myself "Contra Pinball" and I was highly skeptical that the game would be any good. 100's of plays later I am still having a LOT of fun with this one. 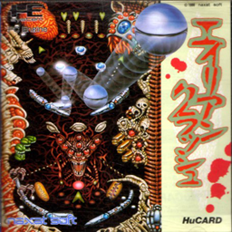 Similar games include High Speed (Nes) and Metroid Pinball (NDS) If you're a fan of video pinball and want something retro to try this is probably in the top 3 best RETRO pinball games of all time! Now you can add videos, screenshots, or other images (cover scans, disc scans, etc.) for Alien Crush (Japan) to Emuparadise. Do it now! If you haven't noticed yet, we have a retro game of the day feature (top-right of the screen) wherein we feature a new retro title every single day! Now, you can vote for your favorite games and allow them to have their moment of glory. 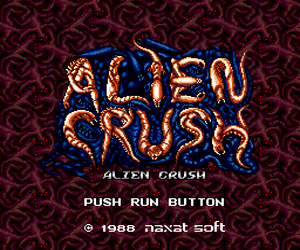 Click on the button below to nominate Alien Crush (Japan) for Retro Game of the Day.